Looking for the right imaging equipment involves making decisions that impact treatment, patient and operator safety, and the hospital or imaging facility’s overall bottom line. 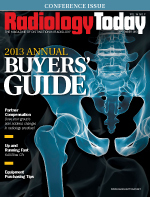 Industry professionals say radiology equipment buyers need to think about more than slices or magnet strengths. For instance, should they buy or lease? What about purchasing preowned equipment as an alternative to new devices or upgrading existing equipment? How should facility operators evaluate services? Overall, how should imaging buyers assess their needs and how does that translate to what they should purchase? Potential customers frequently ask Doug Ryan, vice president of Samsung Electronics America’s health and medical equipment division, what criteria they should consider when shopping for radiology devices. “I turn the question back to them and ask ‘What are your challenges, and how can we help you address them?’” he says. Miller’s company provides permanent or temporary attached or freestanding structures for hospitals or imaging centers to handle new or growing radiology services. Specializing in MRI, CT, PET, and radiology and cardiac cath facilities, he and his brother, Tim, see their clients struggling with equipment purchasing decisions on a regular basis. Zetta Medical Technologies, based in Lake Zurich, Illinois, provides MRI and CT services as well as installations and upgrades of refurbished and preowned equipment and replacement parts. Whether new or preowned, Ghazal says that when qualifying equipment for potential purchase, the criteria for buying can be the same. One fact to consider is the longevity of a particular modality and the progression of imaging technology. What does the imaging crystal ball show as the future’s leading-edge technology? No one wants to spend hundreds of thousands of dollars on equipment that will soon be obsolete. Samsung’s health and medical equipment division itself is a new development in the imaging landscape, announcing its entry into the industry at RSNA 2012. The Ridgefield Park, New Jersey, company expanded its presence in the medical equipment industry with its GEO medical device brand of ultrasound, digital radiography, and in vitro diagnostic equipment. Ryan cites the progression of CT and MRI machines in the past 10 years as evidence that facilities need to think one step ahead of today’s needs. That’s where upgradeable equipment could be a viable and cost-effective alternative to replacing major components, such as an MRI magnet, just a few years after an initial big-ticket purchase. When it comes to parts, Ghazal says to make sure they all meet the original equipment manufacturer (OEM) specs, particularly when it comes to performance levels. The same concerns apply to software, which can negatively affect the machine’s integrity if it does not meet OEM specs. “If a machine was repaired with unauthorized parts, you need to consider how that will impact performance of that machine,” he says. In addition, buyers should make sure their service company has replacement parts on hand. Companies that are low on inventory may need to source parts to cover their service obligation or try to repair components instead of installing immediate replacements while repairs are under way. Beyond the actual piece of equipment, buyers also should consider where it will be housed, Ghazal says, particularly which floor of the building. If specialized rigging is necessary to move the new piece of equipment into place, it could cost more than the actual machine. Also, when it comes to on-site work conducted by equipment vendors, Ghazal recommends that buyers ask for a certificate of liability insurance in their company’s name prior to allowing any work to begin. This certificate should shift the responsibility from the imaging facility to the service provider in the event of injury of service personnel while on site. Industry professionals agree that some of the decision-making process can change depending on whether customers operate a small or large facility or whether they are a for- or nonprofit entity. Ryan says small facilities need to consider the value in making new equipment purchases. Larger facilities may have greater advantages when it comes to making the final decision on which machines to purchase, he says. For example, research is one way to learn more about equipment, and applying for research grants is one way to make that happen. This may not be a viable option for a smaller facility. While analyzing the nuts and bolts and reviewing spec sheets are vital aspects of making purchasing decisions regarding radiology equipment, Ryan introduces another aspect of the decision-making process: health care reform. Imaging is at the forefront in ongoing discussions involving health care cost controls and containment, with radiology targeted as a high-cost, high-utilization service. This makes it even more imperative for hospital and imaging center executives to make the most cost-effective choices for their organizations. Ryan points to cost-containment measures introduced with the Affordable Care Act (ACA) and their overall fiscal impact as factors driving decisions today regarding new imaging equipment purchases. Cost controls will need to be evolutionary, not just a one-time event, and hospitals and imaging centers are making decisions today for the long term. Despite a marketplace full of uncertainty regarding reimbursement and the ACA, Miller says he still finds customers who want all new equipment as it hits the marketplace, “but they pay the price. “You need to make decisions that are best for the practice,” he cautions.